Okay now I have the cold two of the kids had this past week. I am praying that it moves through my system quickly as I have to be out at baseball all day tomorrow. Enough complaining, it will run its course and I will be good as new! 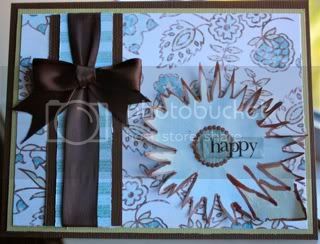 Here is a card I just finished for a Card Tag over at Scrapshotz. I used papers from the October Scrapshotz kit. Patterned papers are Fancy Pants, cardstock is Bazzil. I edged the fussy cut flower with Glimmer Glaze and used Stickles on the dot pattern around the Cloud 9 Design epoxy word. Oh yeah, the ribbon was from the box of cupcakes I bought at Crave Cupcakes this morning.